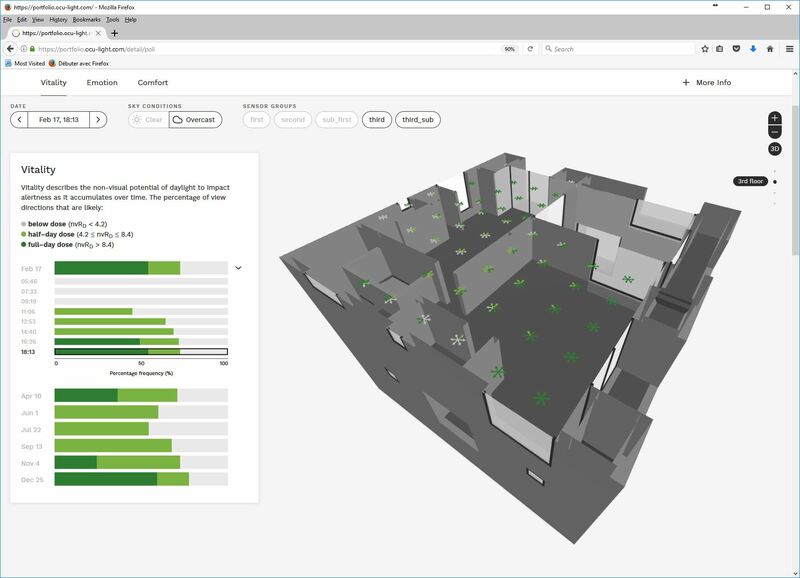 Using OCUSIM & OCUVIS, our new simulation-based tools to evaluate and visualize the occupant-centric effects of daylight in buildings, we can see how ocular light exposure accumulates over time to impact the alertness of humans in buildings*. It turns out the Poli House in Chile, designed by Pezo Von Ellrichshausen** provides good daylight exposure for non-visual health effects, namely alertness or ‘vitality’, even under overcast sky conditions. The window composition, with inset openings which limit direct solar gains and visual discomfort, keep daylight evenly distributed throughout the interior, allowing for healthy light across the multi-level floor plan. Stay tuned for more building-scale evaluations of daylight to learn how our health and well-being may be impacted by the indoor environment. *Vitality model (nvRD) created by Dr. Maria Amundadottir of OCULIGHT. **Building was modeled using publicly available drawings and may not reflect accurate construction details or material properties. Previous Oculight Online Visualizer is Live!